It's been a long day at the inquiry so thanks for staying with us. There was plenty of hard-hitting evidence from two former ministers reflecting how Northern Ireland's devolved administration was run prior to its collapse - scroll down to read all about it. We'll be back at the usual time of 09:45 tomorrow, when Dermot Nolan, the boss of the RHI scheme's administrator Ofgem, will be giving evidence for a second time. 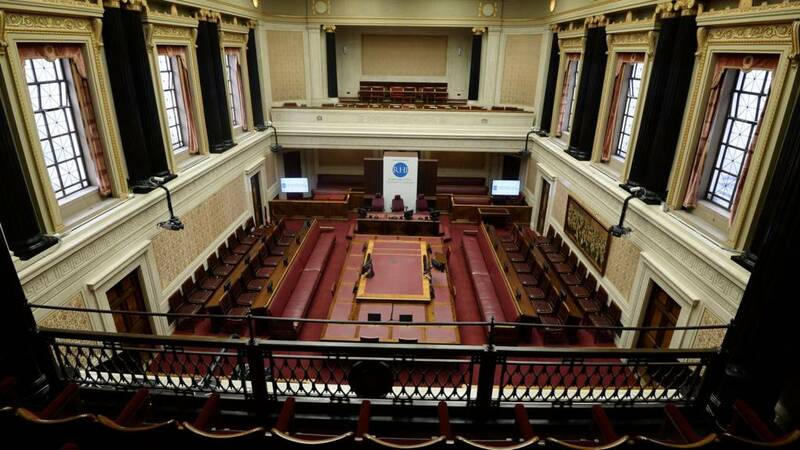 What happened today at the RHI Inquiry? A DUP adviser anonymously sent civil servants' "explosive" emails to the media and to his department's top civil servant in order to take pressure off the party at the height of the RHI scandal, it emerged. Simon Hamilton, a former Stormont economy minister, admitted his adviser had taken the action with his knowledge. He conceded it had not been his "proudest moment" and claimed it was done because his party had been under a sustained attack by political rivals and the media over the cash-for-ash affair. Sinn Féin originally opposed the setting up of a public inquiry into the RHI fiasco - it wanted the then first minister Arlene Foster to step aside to allow a more limited independent investigation to take place. Máirtín Ó Muilleoir says his party was concerned about a full inquiry due to a risk of ministerial interference, the fact it wouldn't have a time limit and the potential for it to cost a vast amount of public money. But he insists there was no reluctance from Sinn Féin to "get to the truth" of the RHI scandal. Ultimately he did set up this judge-led public inquiry - he says he's "proud" to have done so and the "genuine fears" that Sinn Féin had have "proven to be groundless". Before he signed off on the RHI scheme's cost-cutting plan, Máirtín Ó Muilleoir consulted with senior Sinn Féin backroom figure Ted Howell to check he would be "content" with the approval being given the next day. At that stage, three senior civil servants had told the then finance minister that the plan was a viable one. Mr Howell had retired after two decades as a key Sinn Féin negotiator and close aide to Gerry Adams but had been called back by Martin McGuinness to chair a crisis committee to help the party handle the RHI debacle. Mr Ó Muilleoir denies that he was seeking Mr Howell's permission to approve the plan. But he says it's a "political world" and he "could not divorce" the RHI rescue plan from the collapse of the Stormont executive at the time. When a final plan to slash the RHI scheme's cost was presented to the finance department by Stormont economy officials in mid-January 2016, Máirtín Ó Muilleoir told senior Sinn Féin figures it "stacks up" and he was prepared to sign off on it. But he then had some uncertainty about it and discussed the possibility of taking it apart for closer examination. He says he was conscious that he would "carry the can" if it didn't work out and he felt it "needed to be probed and tested" in order to make sure "we didn't stand over another shoddy or botched solution". There was a need for "calm heads" and "it was right to be cautious", with Sinn Féin colleagues warning him it had to be spot on because it would have the party's imprint on it if and when he approved it. "It would be my decision - I would sink or swim based on that decision - and I was determined to get it right." He denies the DUP's ex-minister Simon Hamilton's claim that he was playing a political "game" over the sign-off of the cost-cutting plan. It was a "disgrace" that Arlene Foster told the media about a plan to cut the RHI scheme's cost at the start of January 2017 without first giving that information to the finance department, says Máirtín Ó Muilleoir. He describes the DUP leader as the "architect of RHI" - she was the minister in charge of the enterprise department when it conceived and introduced the scheme in 2012 - and she was then portraying herself as the "saviour". That was a "betrayal of trust" and in reaction he wrote a memo to the then economy minister Simon Hamilton to say he didn't want a "botched solution to a botched scheme" or a "stopgap approach". He spoke publicly about it and inquiry barrister Donal Lunny says that was hardly likely to "make relations better" between the DUP and Sinn Féin. Mr Ó Muilleoir says there was no prospect of improving relations at that point and his action "helped get the solution" to the financial mess. Máirtín Ó Muilleoir admits that Sinn Féin and the DUP were "drawing metaphorical daggers" when they clashed over solving the RHI scheme's budget problem in 2016. Again, Sir Patrick Coghlin isn't impressed - he says "proper politics" is about "trying to find solutions", not "two parties stalking around each other". He tells the witness that while he and Simon Hamilton were bickering over the RHI "the ordinary people in the street [were] losing money - it's disappearing every day". The former finance minister claims he was standing up for people who said there was a "brewing scandal" about the cash-for-ash scheme. He says that within a month of that Sinn Féin's Martin McGuinness pulled "this whole show down" at Stormont by resigning as deputy first minister "because the DUP was dragging the institutions into absolute disrepute". Máirtín Ó Muilleoir and Simon Hamilton were like "two alley cats... fighting" at a time when public money was at threat through the RHI scheme, according to the inquiry chair. There was a need for "a degree of positive cooperation" between Sinn Féin and DUP ministers but what was happening was the opposite of that, concludes Sir Patrick Coghlin. He doubts taxpayers would "have any great confidence" in what was going on between the two former ministers if they "looked at this... with the hope that there was cooperation to try to solve [the] loss of money". The former finance minister says at the time the DUP "had become a byword for less-than-appropriate behaviour in relation to RHI". But Sir Patrick responds: "It's looking for blame - who to blame, how to blame." A plan worked up by the Department for the Economy in December 2016 about how to slash the cost of the RHI scheme was deemed "untenable" by Máirtín Ó Muilleoir. Contrary to what was said by Simon Hamilton this morning, the former Sinn Féin minister says he was committed to finding a solution and that was "absolute". He wanted the economy department to come up with a "robust, cogent solution to the problem" but its favoured £55m buy-out of scheme participants didn't come up to snuff, he claims. "The Treasury would not cover that - it would come out of our budget," he explains. Evidence shows that the Department for the Economy didn't cooperate with finance department civil servants in sorting out the RHI scheme's financial mess, according to Máirtín Ó Muilleoir. "My officials were pressing hard on this that they could not get the information they needed to resolve this issue - that seems to me to be beyond peradventure," he adds. He says he and his adviser wanted to know what the economy department was doing to cut the RHI's cost before it would be given extra money to plug its funding gap. "We were testing them... if they had been responsible for this cataclysmic disaster... let's make sure that we know what's happening." There's "no evidence" that he leaked information from the economy or finance departments and nor did he instruct anyone to do so, he adds. When he became finance minister in May 2016, Máirtín Ó Muilleoir wanted his officials to "go to war" in getting Stormont's economy department to find a way to cut the cost of the RHI scheme. Senior civil servants in his department were "red hot" on the RHI issue and made it clear that it was a "threat" to Northern Ireland's finances, he adds. He's asked about whether the relationship between the finance and economy departments was suited to achieving the best outcome for the public. He says he "didn't dilly-dally" when his officials urged him to "get down and dirty" with the then economy minister Simon Hamilton to get the RHI's budget problem sorted. That doesn't tally with what Mr Hamilton told the inquiry - he said the RHI was only raised by Mr Ó Muilleoir three times and never in a demanding way. Máirtín Ó Muilleoir told a community group that was planning to apply to the RHI scheme that Sinn Féin wanted to see as many people as possible get signed up to it before it shut at the end of February 2016. In an email to Donaghmore District Community Association in Dungannon, County Tyrone, he claimed credit for a two-week delay to the scheme's closure, saying it had happened after Sinn Féin "protested". He added: "We are assessing our options at the minute and will do our utmost to have as many projects as possible green-lighted." That email appears to contradict his claim in his written evidence that he played no role in securing the delay, says inquiry barrister Donal Lunny. Mr Ó Muilleoir sticks to his stance that he wasn't involved in the decision to close the RHI but did "make my view known that we should allow decent, genuine applicants a grace period". And he adds: "I wouldn't be the first politician to try and claim success for something when it was to the benefit of our ordinary constituents." Phones "lit up" when the closure of the RHI scheme was announced in early-February 2016, with businesspeople were saying they would "go to the wall" as a result, says Máirtín Ó Muilleoir. A Sinn Féin councillor in County Tyrone sent an email to Mr Ó Muilleoir shortly after the announcement, making a plea on behalf of businesses in Cookstown for a "deferral" of the decision. Mr Ó Muilleoir was attending a meeting of the Northern Ireland Assembly's Enterprise Committee, of which he was a member at the time, when he got the message. He replied: "Discussing now at the committee and we will kick down the road a bit but unlikely that we can or will stop - Conor [Murphy] leading on it." The witness points out that MLAs hadn't been told at that point that the scheme had struck big budget problems. There was a two-week delay in getting the RHI scheme shut down to new applicants in February 2016 and several DUP witnesses have laid the blame for that with Sinn Féin. That delay ended up costing an estimated £91.5m over the course of 20 years. Ex-DUP adviser Tim Cairns said Sinn Féin's position was that its support for the scheme's ultimate closure came at the price of a delay. DUP leader Arlene Foster said Sinn Féin wanted a postponement of longer than two weeks and DUP chief executive Timothy Johnston said the call for the delay originated from Sinn Féin MLA Conor Murphy (below). Máirtín Ó Muilleoir tells the inquiry that he believed at the time that closing the RHI at short notice was "unfair" on people who had invested big money on new heating systems before submitting their applications to the scheme. He accepts that he's on record "two, three times at least, saying: 'Please don't close this down [so quickly]... let's give [people] a grace period.'" "We thought the immediate closure would cause loss of jobs and loss of business." Sinn Féin's Aidan McAteer is a former prisoner and was barred from being a ministerial adviser at Stormont as a result of legislation passed in 2013 that prevented anyone with a serious criminal conviction from holding such a role. As a result, he was employed and paid by Sinn Féin rather than being paid directly from public funds like official ministerial advisers. Máirtín Ó Muilleoir says Mr McAteer's role as a party adviser was no different to official ministerial advisers and he was involved in interacting with senior civil servants about Northern Ireland Executive business. But inquiry chair Sir Patrick Coghlin says Sinn Féin was therefore in "deliberate breach" of the code of practice, which states that civil servants are not to be directed by people paid by political parties. Mr Ó Muilleoir says Sinn Féin "was not going to... discriminate against people who had the ability, skills and competence" to advise ministers because of the 2013 law on the appointment of aides. Sir Patrick says that's no reason for not adhering to the rules. He points out that the inquiry's line of questioning on the issue should not be taken as a querying or criticism of Mr McAteer's work as a political adviser. One Sinn Féin adviser carried "more authority" than others, says Máirtín Ó Muilleoir. Aidan McAteer was an aide to the then deputy first minister Martin McGuinness (below) and that meant he had an "elevated position" and was "absolutely" the most senior adviser. Asked if Mr McAteer also managed Sinn Féin ministers, the witness says he "coordinated our actions... and would've worked very closely with us". "We knew when Aidan McAteer contacted us he was speaking on behalf of the deputy first minister... so he was certainly listened to." The way in which advisers were appointed by Stormont ministers has been one of the hot topics during the RHI Inquiry - it's a particular cause of concern for inquiry chair Sir Patrick Coghlin. It's emerged that the DUP didn't comply with a Stormont code of practice in appointing advisers - its chief executive Timothy Johnston said the party was "trying to mirror" what other parties were doing. Asked about his party's approach to the appointments, Sinn Féin's Máirtín Ó Muilleoir says he doesn't "recognise the process the DUP followed". The former finance minister says he considered three people who could advise him. Two were from outside Sinn Féin and worked in the private sector but they were ruled out when it turned out the salary on offer wasn't big enough and they deemed the round-the-clock nature of the job to be too demanding. Mr Ó Muilleoir ultimately appointed Eoin Rooney - his statement to the inquiry is available here - who was a Sinn Féin policy adviser. The MLA says Mr Rooney had relevant experience and competence for the job and he believes he's been "vindicated" in his decision to appoint him. Sinn Féin's Máirtín Ó Muilleoir makes an affirmation in both English and Irish that he'll tell the truth to the inquiry. He was Stormont's finance minister from May 2016 until Stormont went up in flames in January the next year. During his time in the role, he announced the creation of this public inquiry into the cash-for-ash debacle. He's the first and only figure from his political party to give evidence at a public hearing in this inquiry - others have done so in writing. He says his private sector experience in running Belfast Media Group, which owns newspapers including the Andersonstown News, was one of the reasons why Sinn Féin's former Stormont leader Martin McGuinness appointed him as finance minister. The South Belfast MLA has given written evidence to the inquiry - you can read his statement here. Sinn Féin was playing a party-political "game" with the approval of the cost-cutting plan for the RHI scheme in January 2017, claims Simon Hamilton. The changes had to be signed off by Stormont's finance department, which was being run by the Sinn Féin minister Máirtín Ó Muilleoir (below, centre). In a memo to Mr Hamilton, Mr Ó Muilleoir described the plan as "a piecemeal approach" and said the handling of the RHI had been "characterised by at least incompetence and possibly corruption". Mr Hamilton says finance department officials had recommended the plan to Mr Ó Muilleoir but the minister didn't give it the rubber stamp, which he believes was down to "foot-dragging" by Sinn Féin. "We [were] kept dangling by a thread effectively by Sinn Féin about whether it was going to be approved or not." His view is that it was "not being viewed on its merits" by Sinn Féin and instead "being viewed through the prism of politics". He had "genuine concern" that MLAs wouldn't vote the plan through because of that lack of approval but ultimately they did.